Looking for downloadable templates to customize? They will be available for free alongside a full-featured online course on our publication date, May 14! Sign up for Sage’s newsletter to be the first to know when they go live. Create yoga class themes with yoga philosophy, inspirational quotes, and simple concepts that inspire and motivate students. New yoga teachers are often taught the poses but not themes or phrases that will make students come back and seasoned instructors often want a fresh approach or new theme to explore. Experienced yoga instructors Sage Rountree and Alexandra DeSiato give yoga teachers tools to find a genuine voice and tap into innate wisdom; offer ready-made, detailed themes to use in classes or home practice; and provide guidance and useful, flexible templates for building a toolkit of authentic themes for future use. The workbook begins with a section on voice, authenticity, emulation, phrasing, practice, repetition, and finding inspiration. 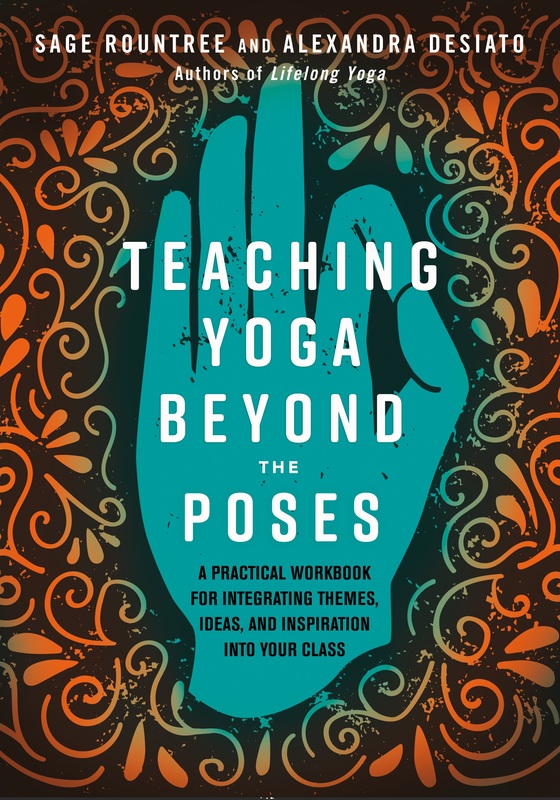 While offering guidance for new or experienced teachers so that they feel confident speaking from a place of authority and offering their students memorable themes, the authors explore what it means to be authentic and how teachers can approach authenticity without feeling overly exposed or turning their yoga classes into a therapy session. The second section of the book contains 54 complete themes in template form, so instructors can easily use them in a class. These themes are broken down in chapters such as: yoga philosophy, seasonal themes, meditations, quotes, and spiritual ideas and stories from other traditions that translate well to yoga. Each theme is explored in a way that allows teachers to add their own voice, take, and spin. The final section of the book includes gentle advice and prompts with 54 blank templates, so instructors can create their own themes. With a unique angle and a practical feel, this workbook will appeal to yoga teachers, teacher trainers, and at-home practitioners who are moving to the next level.